It is great for four, five and six year olds. Most two and three year olds like it. Older kids like it as long as parents are strong. We have many older kids and disabled adults that are riders. How Much Can the Pack Hold? It is very strong. It can carry as much as you can. How Many Sizes Does the Pack Come In? One size fits most. Parents as short as 4′ 6″ and as tall as 6′ 7″ use the pack. Kids as young as two and as old as 80 have been riders! Does it Come With a Backrest? Does the Under Seat Bag Come with the Pack? Packs are usually shipped in 0 to 1.5 business days, typically UPS or USPS. Expedited shipping available on the purchase page. How Do I Get a Harness? 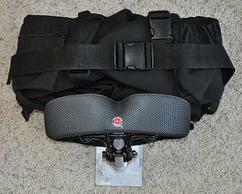 Harnesses, as discussed above, for $20. Custom second stirrup rungs for riders over 5′ tall (these packs are not returnable) for $20. Fully assembled (without the backrest), it fits under most airplane seats and under your feet on many amusement park rides. If you are good at assembly, the seat and frame can easily be taken off to make it even more compact. Why is There Not More Padding on the Shoulder Straps? If you’re carrying the load on your shoulders, you’re missing the point to get the weight transferred through the frame to your hips. 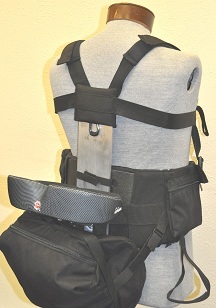 Keep the waistband tight, the chest strap snug and the shoulder straps a little loose. How Much Does the Pack Weigh? Yes! See the order page for shipping costs. 30-day money-back for standard packs and harnesses.